Trust One Another – When team members are genuinely transparent and honest with one another, they are able to build vulnerability-based trust. Engage in Conflict Around Ideas – When there is trust, team members are able to engage in unfiltered, constructive debate of ideas. Commit to Decisions – When team members are able to offer opinions and debate ideas, they will be more likely to commit to decisions. Hold One Another Accountable – When everyone is committed to a clear plan of action, they will be more willing to hold one another accountable. 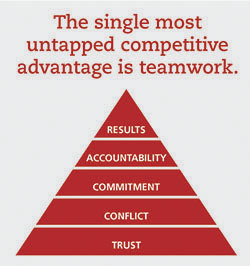 Focus on Achieving Collective Results – The ultimate goal of building greater trust, conflict, commitment, and accountability is one thing: the achievement of results. The program helps teams understand how, as a team, they score on the key components of The Five Behaviors model: trust, conflict, commitment, accountability, and results. Each individual on the team will also understand their own personality style and their team members styles, based on the DiSC® model: D: Dominance, i: Influence, S: Steadiness, and C: Conscientiousness, and how their style contributes to the team’s overall success. Who is it for? The program is designed exclusively for intact teams and work groups. The Five Behaviors of a Cohesive Team harnesses the power of Everything DiSC and the clarity and simplicity of The Five Dysfunctions of a Team model. Enrichment Training Resources is an Authorized Partner of The Five Behaviors of a Cohesive Team and Everything DiSC. Please contact us or call 847-359-6401 for more information.